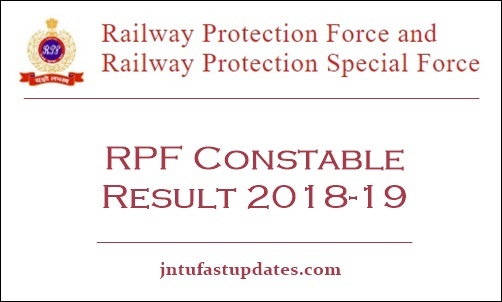 RPF Constable Result 2018-19: Railway Protection Force (RPF) conducted the Constable written test from 20th December 2018 to 2nd February 2019 on various dates. A large number of competitors have clashed for the RPF Constable written test as per the scheduled dates. Railway Protection Force has conducted the Computer Based Test (CBT) for all the aspirants. The examination has been held in various examination centers across India. The organization conducted the written test round with special care. Now, the RPF released the answer keys for each completed examination on its official website, rpfonlinereg.co.in or indianrailways.gov.in. Candidates can go through the answer keys and estimate the score by tallying with the answers. And the hopefuls waiting for the result can stay checking the same portals for more updates. Yet, the RPF has not announced the RPF Constable Result date. As per the reports, soon it will declare the result for constable written test. Here we will leave an update as soon as the RPF announced the result date of constable exam. Aspirants competed for the RPF Constable written test can expect the result in March/April months [tentatively]. The competitors can check the result, score when it is available. The competitors can stay checking the RPF website or Indian Railways websites to download the result. The competitors can check the cutoff marks/qualifying marks along with the results. Candidates scoring the requisite qualifying marks in the exam will get the chance to take part in the next rounds of the selection process. RPF will release the RPF Constable merit list 2018-19 with the names of qualified candidates. Competitors can check the RPF Constable cutoff marks, merit list along with the result. Stay checking the RPF portal for more updates. The RPF Constable Result, cutoff marks, and merit list will appear on the screen.